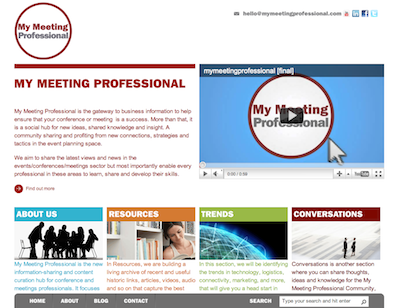 My Meeting Professional is the gateway to business information to help ensure that your conference or meeting is a success. More than that, it is a social hub for new ideas, shared knowledge and insight. A community sharing and profiting from new connections, strategies and tactics in the event planning space. We aim to share the latest views and news in the events/conferences/meetings sector but most importantly enable every professional in these areas to learn, share and develop their skills.